ÜberTwitter Launches With TweetPhoto Integration! ÜberTwitter, the awesome Twitter client for BlackBerry devices has been growing at a rapid pace these days. After being named the top Twitter client for BlackBerry, it then teamed up with Twitvid.com to use their services to send videos to Twitter right from your device.This time around ÜberTwitter has teamed up with TweetPhoto to use their wide array of API's to provide everyone with a great device to Twitter picture posting process. Today's announcement shows that ÜberTwitter has no plans in slowing down on its development and plans to bring even more to its users. Full press release is after the jump. 09.15.2009 -- San Diego, CA – TweetPhoto today formally announced its partnership with Virginia based ÜberTwitter, a company devoted to delivering highly functional Twitter clients for mobile devices, with the release of ÜberTwitter’s beta 5 BlackBerry application. Last week TweetPhoto became the default photo sharing provider in, the ever-popular Twitter client, TweetDeck based on the merits of its developer platform. 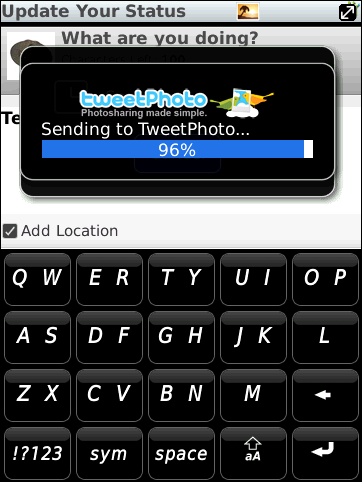 More and more developers are turning to TweetPhoto every day. The new version of ÜberTwitter will be the most extensive integration of TweetPhoto into any one application. Among bug fixes and further stabilizing the application, Beta 5 will utilize TweetPhoto’s uploading, voting, favoriting, commenting and geo-tagging feature-sets. The app will also allow users to view all photos they have uploaded, comments posted on photos and much more. ÜberTwitter offers a free version of the software, supported by advertisements, and a paid version for only $4.99 which comes with unlimited upgrades for one year and no advertisements forever on any of the new versions released during the subscription year. The new version of ÜberTwitter will be available this morning at http://www.ubertwitter.com/bb/download.php and will be submitted as a free application on BlackBerry’s App World, the official store for BlackBerry apps. TweetPhoto is a photo sharing platform for the real-time web. Our free service allows users to share photos on Twitter, Facebook and through their favorite desktop and mobile clients. The service focuses on creating the best possible user-experience among the applications developed around the Twitter Application Programming Interface (API). This personalized experience is the evolution and convergence of real-time mobile and web-based social photo sharing. It allows users to quickly and easily publish and consume photos. The company has positioned itself as the leading photo sharing platform within the Twitter eco-system by presenting the developer community with the most expansive and easy-to-use API available. TweetPhoto is feature rich and simply a better way to photo share. The company aims to change the way in which people socially share, discover and interact with photos across multiple social networks in a way that feels natural and engaging to users.